I really liked this all-cornmeal version of cornbread. I added 1.5 cups of grated zucchini as suggested in one variation, but didn't see to reduce the buttermilk (I used sour milk) to 1.5 cups. I also used 2T honey, 2T oil, and 2 eggs. I was VERY glad I used a pan that was closer to 9x13 than an 8"square pan; it would've taken it forever to cook. There was a bit of egg custard on the bottom, but cutting down on the buttermilk would help with that. A great way to use up some zucchini, and great corn flavor. The classic, bestselling cookbook devoted to baking honest, delectable, and nutritious whole-grain breads--updated with a new chapter on bread machines and original recipes. The Laurel's Kitchen Bread Book has long been regarded as a classic because of its clear, detailed explanations, beautiful woodcut illustrations, and great recipes. Home bakers and bakers in small-scale local bakeries refer to it as the bread bible because, even after all these years, The Laurel's Kitchen Bread Book is still the only guide to making light, delicious breads of every sort--entirely from whole-grain flours. This specially updated guide includes a brand-new chapter on bread machines. Laurel has personally tested a range of machines, evaluating which self-proclaimed whole-wheat-capable breadmakers produce bountiful loaves and which fall flat. 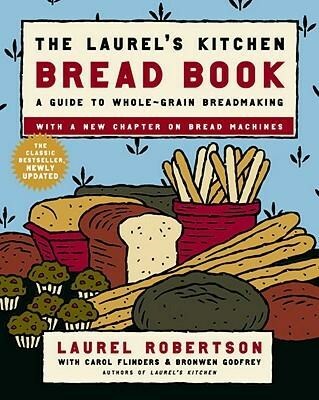 The updated volume also includes new recipes specifically designed for machines, so even the beginning machine-user can experiment and create the healthy and flavorful loaves for which Laurel's Kitchen is famous.